Show us your set up in action at night. I'm almost a complete newbie after recently getting interested in astronomy, and am currently reading a couple of books, making sure it's not something I'll loose interest in, before pulling the trigger on a telescope. Just wanted to say hi and I'm happy to be joining what seems a great community. My name is Wojtek and I am living in Gdansk. I'm observing the sky thru few binoculars and SkyWatcher 100ED. 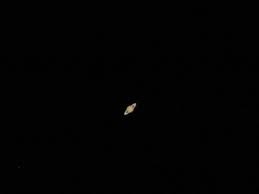 If you have an eyepiece that magnifies 50x or more, you should be able to discern Saturn's rings. Good luck! Will i be able to see saturns ring with my F70076 telescope? Can u advice me how? Thank you so much as I anticipate your reply. 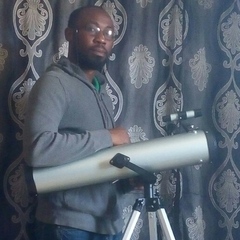 I am also four eyed too ( as people who use glasses are refared to in Nigeria), astigmatism, bt I can stil use my telescope with out my glasses. I guess the reason for the our different observation time is because am in Oyo state, Nigeria. Yes, the photo did paint a clear picture of my poem. Maybe I will do as you did and take a picture of Venus and Jupiter tomorrow morning as they pass by. I think one good thing to be in Nigeria with out constant power outage is it gives us a dark background for a clearer observation. As I watch the east-west sky. That is much more bigger. Since I got my Newtonian. In today's 5:46 morning sky. You have been my brightest stars. Yes, the second one does it for me as well. I am only just beginning to get to grips with my Star71, but I am really impressed with the results it gives. I almost balked at the price for a "small refractor", but I'm glad I didn't, they are such nice scopes. 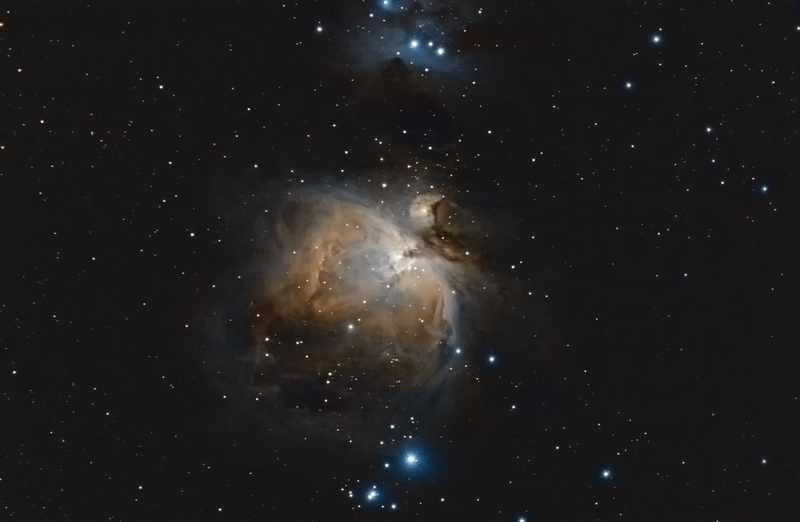 Can my F70076 refractor see Orion like he did? Last night was a surprise clear night for for me as it wasn't forecast so i very quickly threw together a dual rig from bits and dovetails i had lying around. Both images are very far from perfect due to short integration time, almost full moon and a street light around 40 ft away and a few degrees under Orion. 1st is an hour of 30 second subs from my Canon 6D and FLT 98. I'm rather happy with my stars since this is a full frame camera used with a hotech field flattener. 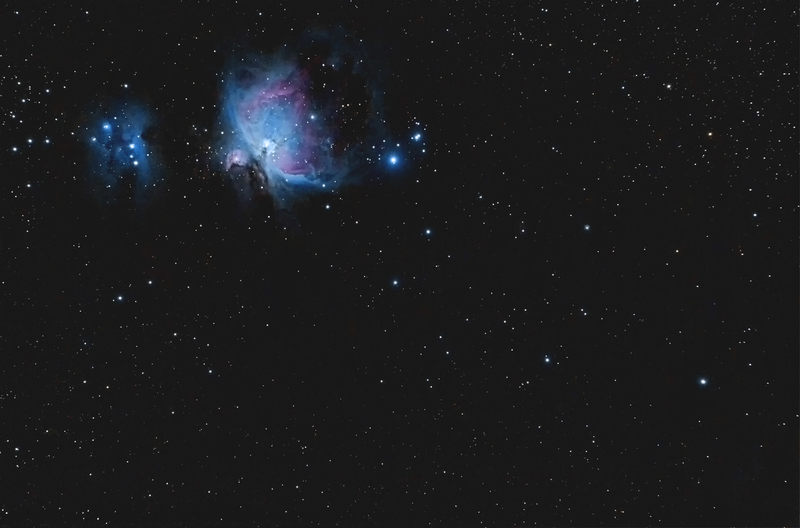 2nd image is just over an hour in 60 second subs, software binned 2X2, with my QHY183C and WO Star 71. Hi... Goodmorning.. These are beautiful... I wish I can see these too via my telescope. 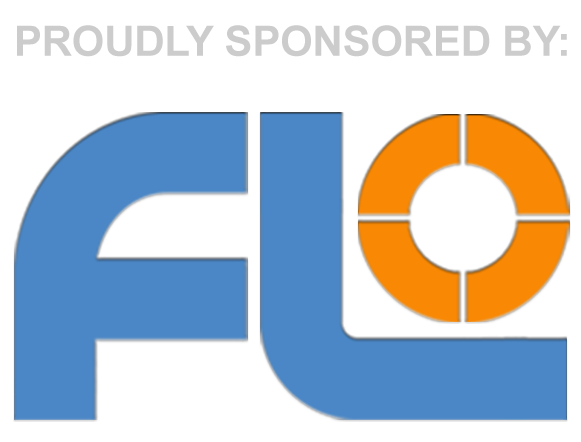 I have an F70076 refractor with a 20mm, 12.5mm, 4mm eyepiece, and 2X Barlow. Can I catch Orion as you have with my F70076 refractor? That's a nice follow up on your recent Moon poem. I think it's a wonderful way to record your observations and thoughts. Equally valid as sketching or imaging. You have a talent for it. Thanks Paul, am glad u like it. I really wish I can take photographs of what I see but iv been unable to. Maybe I need some kind of device. Venus really does make for some great viewing at the moment. I caught it in the binoculars along with Mercury and Jupiter this morning. Trust what ever advice you get cos its the possible best. In the calmness of the morning sky. Honestly﻿ Venus looked better in the eyepiece than how the image came out. The bright star I saw this morning at 6:30 across the south east skies looked exactly like this in your photo when I viewed it through my F70076 refractor telescope... I think iv seen Venus too. Is Venus the bright star that appears as an orb resembling a small half moon in the south-west morning skies when viewed with a telescope few hours before sun rise? That's probably the easiest one of all to split. Where is this one located? I will try my telescope on Orion as you advised. Luckilly the constellation is one I can easily reconize.